My wife and I homeschool our children and since I'm the one with the history degree, it became my responsibility to teach that subject. I also have been teaching a biblical archaeology class once a week to 5th and 6th graders. As I have been teaching through these subjects, I am finding more and more uses for the Pictorial Library of Bible Lands and am finding that with search tools it is easy to quickly find things in there that relate to a particular lesson. For example, I was teaching my children about the Minoan civilization last week. We have a helpful book called The Usborne Book of World History which provides numerous images about various historical peoples and events, so I was using that to illustrate what the Minoans looked like and how they lived. Then on a whim I turned to the PLBL to see if I could find any photographs of the excavations at the Minoan city of Knossos ... and I was not disappointed. After a quick search in Picasa, not only did I find a whole section of Volume 13 that is devoted to Knossos, but I even found a picture of one of the same items that was illustrated in the Usborne book. 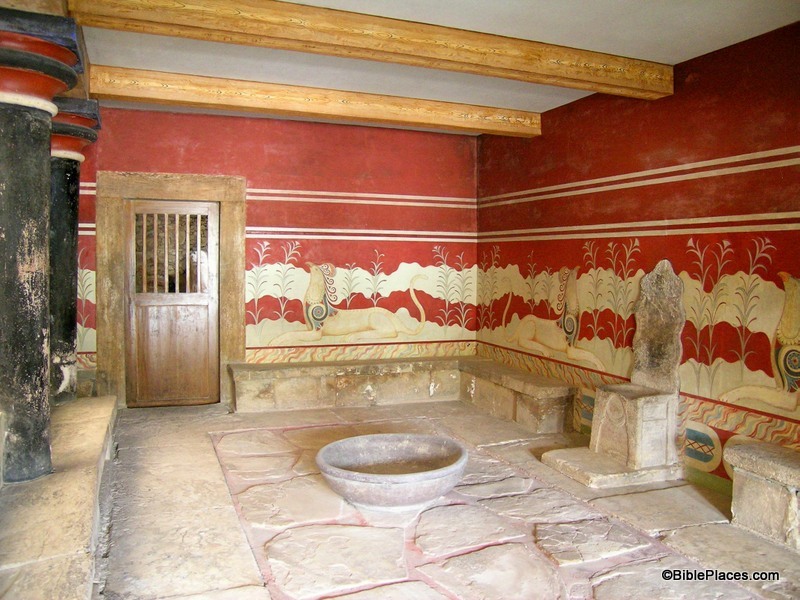 The image below shows the throne room of the palace at Knossos. The walls are decorated with colorful frescoes, and on one side of the room stands a gypsum throne. According to The Usborne Book of World History, this is "the oldest throne in Europe still standing in place" (p. 25). So once again, the PLBL comes to the rescue. 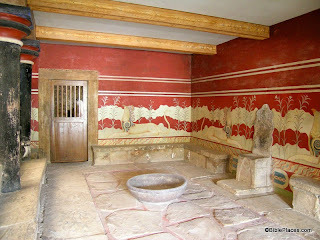 I was able to use this image and others in the collection to give my kids a feel for what it would be like to visit Knossos on the island of Crete. There is no sign yet that any of my kids will follow in my chosen profession, but it's still early (my oldest is only 7) and I have plenty of time to whet their appetite for a lifetime of study in the fascinating world of the ancients. And I am sure the PLBL (and the Historic Views collections) will continue to play an important role in educating my children. This photograph and over 700 others are available in Volume 13 of the Pictorial Library of Bible Lands, and is available here for $24 with free shipping. For more photos and information on sites in Crete, see the BiblePlaces website here, here, here, and here. Can you explain what you mean by a quick search in Picasa? I have used picasa for my own personal pictures, but how can we duplicate what you did with the PLBL? Sorry for jumping the thread but: when you upload the Library into your computer, generally you have a choice to add the pics to Picasa. Oh, thanks for the look at 'Sukkot' the Feast of Tabernacles/Booths. Very informative! Mondo - you do need to copy the jpg images onto your hard drive. Then Picasa should index them automatically (you can check the settings in Picasa if you don't see them). It makes finding photos quick and easy, though I would add that sometimes you'll want to use the PowerPoint presentations instead of the jpg images because of the additional labels and annotations. Todd and Howard are correct. You will need to copy the pictures to your hard drive, give Picasa time to index the files, and then you can use the search field in the upper right corner. Todd is also correct about the usefulness of the PowerPoint presentations, but Picasa can be a useful place to start. By doing a quick search in Picasa you can find out which folder contains the pictures you want. Then you can open the PowerPoint presentation that corresponds to that folder. The PowerPoint presentation will provide a map, will put the images in a logical order, and will provide labels and annotations. But if you are just doing things on the fly (like I was the other day), you can start a slideshow straight from Picasa. Do your search, then double-click on the first picture, then click on "Play" in the top bar. Some sample images were all I needed the other day and that method got the job done.